Tiger gave it the Jack Nicklaus step at 16 as he walked a birdie into the hole. Could there be a 15th major in the wind for Tiger Woods? Could there be a fourth Green Jacket? Those questions will be answered when Woods finds himself playing in the final group of the day on Sunday. 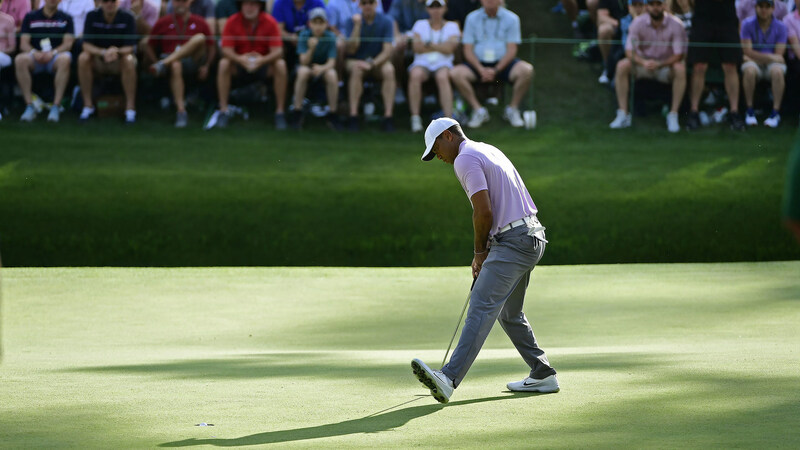 Woods’ walked in a birdie putt at the 16th hole that got him to 11-under par and he’d finish with a 67, his best round at The Masters since 2010. Tiger’s day got off to a less than impressive start. After a routine par at the first, his drive at the second caught the bunkers on the right side of the fairway and he would fail to make birdie on the par five. The third hole was giving up a lot of birdies and Woods failed to capitalize there. After par at four, Woods once again caught the large bunker to the left of the lengthened fifth hole and he’d end up with bogey. One-over after five left him looking up at a half-dozen players. But he got to work starting with a birdie at the sixth then another at the seventh. At the par five eighth Woods hit a splendid second and had just 10 feet for eagle but missed left. Still, he’d turn two-under. Woods had some good fortune on the back nine. An errant drive at 11 left him with an opening and he’d make par there. He pulled his drive dangerously left a the gettable par five 13th. He had to lay-up but managed to hole an eight-footer for his birdie. A nice pitch at 15 led to another and he was 10-under going to the 16th. He hit a great iron shot that settled just seven feet from the hole and he walked that one in to get to 11-under and punch his ticket to the final group.